Betabrand CEO Chris Lindland holds up a shoe while being interviewed at a Betabrand store in San Francisco, Feb. 15, 2018. Prototypes? Passe. Fashion company Betabrand saw that knitwear was a hot style in sneakers and wanted to quickly jump on the trend for dressier shoes. It put a poll up on its website asking shoppers what style they liked, and based on that had a shoe for sale online in just one week. 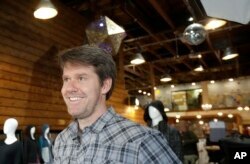 Betabrand CEO Chris Lindland smiles while interviewed at a Betabrand store in San Francisco, Feb. 15, 2018. 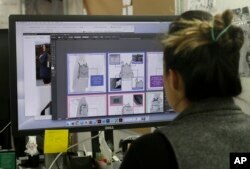 Designer Tiffany Tam shows sketches of a handbag she designed on her computer at a Betabrand store in San Francisco, Feb. 15, 2018. 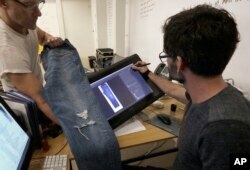 Bart Sights, head of the Eureka Lab, left, and Aykut Aygun, manager of technical innovation, give a demonstration on designing jeans at Levi's innovation lab in San Francisco, Feb. 9, 2018. "Thirty years ago, jeans were only available in three shades — rinse, stonewash and bleach," said Bart Sights, head of the Levi's Eureka lab. "Our company now designs 1,000 finishes per season." Such a long lead time "pushes production and creation too far away." Levi's latest technology alleviates this issue, he said.